Log in or create an account to apply to volunteer or contact the coordinator! Help connect to your community and make it a better place. Help build capacity for United Way. No Do Some Good users are currently registered. Be the first! 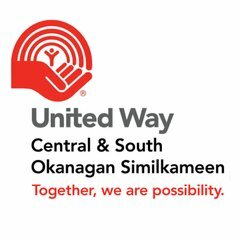 United Way Southern Interior BC serves the communities of the Okanagan, Columbia, Shuswap and Similkameen regions. Formed by the merger of United Way CSO and United Way NOCS, United Way SIBC builds on over 65 years of community investment. Our mission is to improve lives and build community by engaging individuals and mobilizing collective action. The United Way invests time and resources in three focus areas that support all that kids can be, move people from poverty to possibility and build healthy, strong communities. For more information, visit www.unitedwaysibc.com or call 1-855-232-1321. For the North Okanagan office, call 1-866-GIVE4UW. SIBC Admin office: 202-1456 St. Paul St.